Found in the archives of the U.S. Department of Justice, this 1988 document lays out the rituals, mind control methods and the symbolism of satanic groups in the United States. 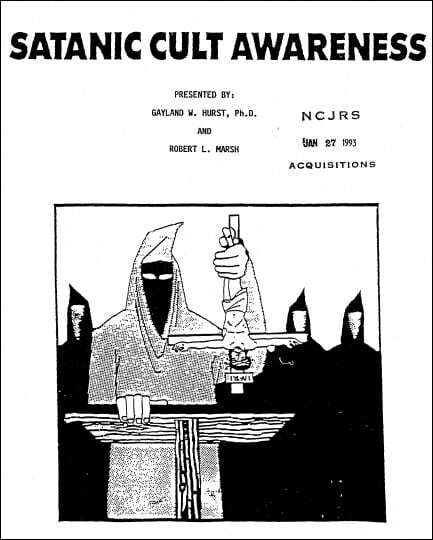 The Satanic Cult Awareness guide was together by a team researchers and law enforcement officials around 1988. The data in this document was compiled to help investigators better understand crimes motivated by cults and Satanic rituals. At that time, several high profile cases involving Satanic Ritual Abuse (SRA) made the news and triggered a phenomenon that media now calls “Moral Panic” or “Satanic Panic”. The full document was archived by the National Criminal Justice Reference Service. This article extracts some of the document’s most relevant information.